Spyware by Israeli cyber surveillance company NSO Group played a role in the events leading to the death of Saudi journalist Jamal Khashoggi, according to American whistleblower Edward Snowden. The former CIA employee and contractor for the NSA, who in 2013 leaked the most comprehensive collection of top-secret documents demonstrating the NSA’s systemic spying on millions of U.S. citizens, spoke via video at an event on Tuesday. 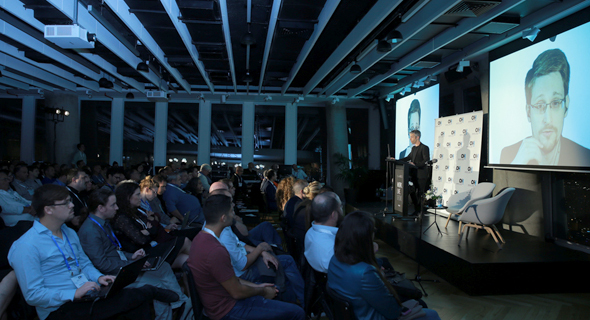 Hosted by strategic media company Orenstein-Hoshen Media Strategy Ltd., the event took place at Labs, a co-working space at the Azrieli Sarona tower in Tel Aviv. After noting that his decision to appear in front of an Israeli audience has sparked controversy among many of his friends and followers who oppose the Israeli occupation of Palestine, Snowden quickly steered the conversation to NSO Group. Founded in 2010 and headquartered in central Israel, NSO develops trojan horse spyware for mobile phones and other devices, which the company says it sells exclusively to governments and law enforcement agencies. Called Pegasus, NSO’s spyware has been implicated in alleged human rights violations in the past. Following the disappearance of Khashoggi inside the Saudi consulate in Istanbul, on October 24 Citizen Lab researcher Bill Marczak appeared on CNN together with Saudi dissident Omar Abdulaziz, a friend of Khashoggi who has been in contact with him regularly prior his disappearance. Marczak told CNN that Abdulaziz was one of those targeted with NSO’s spyware. Snowden made the inference that the Israeli company played a role in his death. Following international pressure, Saudi Arabia has admitted that Khashoggi, who was a critic of the Saudi regime, was killed inside the Saudi consulate in Istanbul last month. Khashoggi’s disappearance and later the conclusion of his death have been widely investigated and reported by international media. For the past two years, Citizens Lab discovered 1091 IP addresses and 1014 domain names which it was able to match with 36 distinct Pegasus systems, each thought to be run by a different operator. Twelve operators appear to be focused on Middle Eastern countries, five each on Africa, Asia, and Europe, and four on the Americas, three of whom appear to focus exclusively on Mexico. In September, a report by Citizen Lab stated that NSO’s Pegasus had been detected in 45 countries, including in Israel. Among the countries where Citizens Lab detected activity by Pegasus operators were the U.S., U.K., Canada, India, Singapore, the Netherlands, Brazil, the UAE, Saudi Arabia, Egypt, Jordan, Lebanon, France, Uganda, Algeria, Uzbekistan, South Africa, Bangladesh, Oman, Togo, Tunisia, Zambia, Morocco, Poland, Qatar, Ruanda, Yemen, Kenya, Switzerland, Bahrain, Israel, and the Palestinian territories. Speaking on Tuesday, Snowden delivered a warning about surveillance to his Israeli audience. “Israel really has a leg up in technology, and particularly in this kinds of offensive operations,” he said. “This is not a cybersecurity industry, this is the cyber insecurity industry,” he said. Replying to Calcalist’s request for a comment, a spokeswoman for NSO said Wednesday that technology by NSO assists on a daily basis in saving countless people from terrorists, drug lords, child-abductors, pedophiles, and other criminals.